Q. Lutatius Cerco was a Quaestor in 108 or 109 BC, and struck coins in this respect. He is not known to have progressed any further in his career. Gens Lutatia, occasionally written Luctatia, was a plebeian family of ancient Rome. The first of the gens to obtain the consulship was Gaius Lutatius Catulus in 242 BC, the final year of the First Punic War. Orosius mentions their burial place, the sepulchrum Lutatiorum, which lay beyond the Tiber. 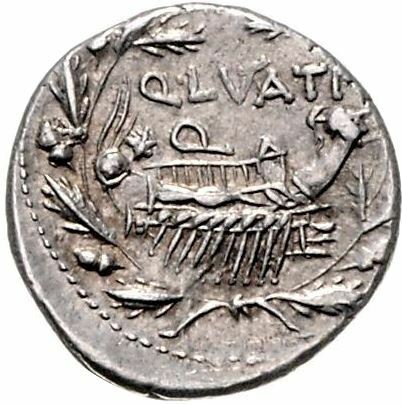 The surnames of the Lutatii under the Republic were Catulus, Cerco, and Pinthia, of which only the second is found on Roman coins. Catulus, borne by the most famous family of the Lutatii, is probably derived from the same root as Cato and Catus, which originally described someone shrewd, wise, or cautious. An alternative explanation would translate the surname as "puppy, whelp" or "cub". Cerco, borne by some of the Catuli, refers to a tail.